Join us for two days of fun, sun, and whitewater on the South Fork of the American River, one of the most popular whitewater rafting trips in the world! A perfect way to relax, unwind and enjoy time with family and friends. This trip makes for a perfect family outing and we offer some amazing midweek family specials. Arrive the day before your two day rafting trip at our deluxe campground, complete with indoor restrooms and free hot showers, swimming pool, volleyball court, and more, situated just above Troublemaker Rapid on the South Fork. Your two day South Fork American River rafting adventure begins the morning of your rafting trip with a hearty breakfast then, after an informative safety talk, you’re off to the river for a day of fun, laughter, excitement, and lots of exhilarating whitewater. The first few rapids you’ll encounter on the lower stretch are small but spirited and will allow you to practice your new paddling skills. Then a huge deli-style lunch to match those big, outdoor appetites will be set out for you by the side of the river. After lunch, we’re off to challenge “The Gorge” and experience the excitement of outstanding rapids such as Satan’s Cesspool and Hospital Bar. Just before you hit Folsom Lake our own Honda Jet Ski will meet you for the tow to the take-out at Salmon Falls – this way you avoid a 2 mile paddle out with a headwind. At the end of the day’s rafting, cold beverages and transportation back to camp await you. At camp you can enjoy some tasty hors d’oeuvres, a hot shower or free time until we serve a delicious, healthy dinner with dessert that will satisfy the heartiest appetite. On the second day of your South Fork rafting adventure will start following another delicious breakfast. On the Chili Bar white water rafting section the thrills start swiftly on the upper stretch with almost 6 miles of continuous rapids one after another. This river rafting section is filled with outstanding whitewater including rapids such as Meat Grinder, Triple Threat and it all culminates in the biggest of them all – Troublemaker Rapid located just above the take-out. This days rafting with end between 11:30 AM and 12:00 PM, plenty of time to freshen up before a yummy burrito bar lunch. A tasty lunch back at camp completes your unforgettable two day South Fork rafting trip. You’ll leave with memories of the beautiful scenery and thrilling white water rapids, feeling fully relaxed and invigorated, quality time spent with family and friends wanting to come back again. Relax after lunch before packing up and heading home or a better option is to go explore James Marshall Gold Discovery Park where gold was discovered in 1848 leading to the California Gold Rush. 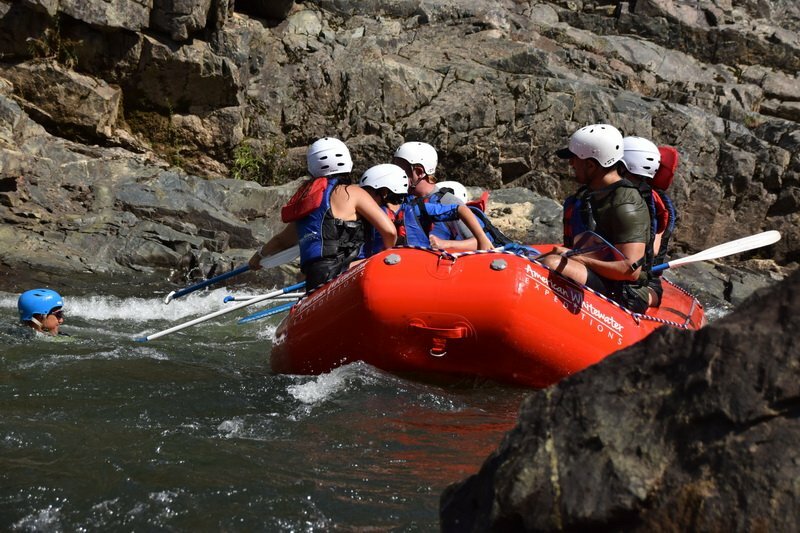 This Two Day South Fork rafting adventure is offered on Monday/Tuesday, Tuesday/Wednesday, Wednesday/Thursday, Thursday/Friday, Friday/Saturday, Saturday/Sunday, and Sunday/Monday. Departing from our River Camp in Coloma. Please Click for Directions to our River Camp. This rafting trip leaves our River Camp at 10:00 AM so if you are not camping with us the night before then it’s imperative that you arrive by 9:30 AM at the latest. Get ready for some awesome South Fork rafting action! Check out our Equipment List for items you will need for your river trip as well as Maps and Directions to our River Camp. Group Specials For every 5 paid rafters the 6th goes for 50% off. For every 11 paid rafters the 12th goes for FREE. Family Midweek Specials Apply. Groups of 24+ Please call for Special Group Prices. NOTE: Youth prices are for ages 6 to 16. Prices are pre person and there is an 8% Govt Land & River Use Fee added to all prices above.